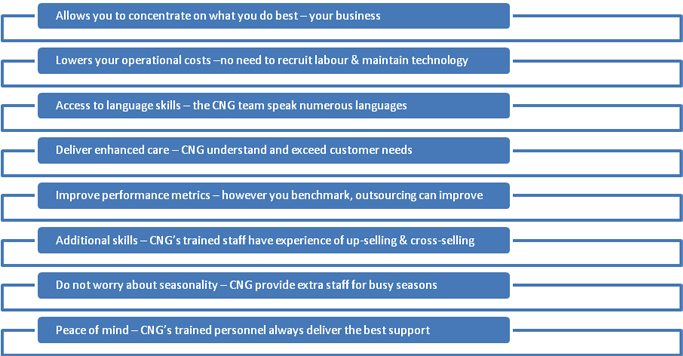 CNG Business Services provides comprehensive end-to-end customer support solutions. We can help you from the beginning of the sales cycle, dealing with pre-sales enquiries, when a potential customer calls to ask more about a particular product or service that you offer. We can ensure that when your potential customers call, they are met with courteous and well-trained customer support staff that not only can answer questions about your products, but also explain why they are better than other offerings on the market. Once an enquiry is converted to a sale, we can provide the right blend of customer service etiquette and soft skills to make your customer feel valued. In these days of intense product competition, superior customer support is one the key tools that companies have to retain their customers. By providing the highest quality customer support services, you are giving your customers an extra reason to stay loyal to you. If a customer calls to track the status of an order, we can look this up on your systems to provide an update.If for any reason a customer’s order is experiencing delays, we can assure them that their order is personally being tracked for them and provide them with updates.Again, the differentiation in service is what makes you stand out even more from your competition. If you regularly receive calls from customers looking to place or track the status of orders, we can route callers through our phone system to the specific department dealing with their enquiry. And, if necessary, we can provide a message facility whereby callers can leave a message and be prioritised for call backs. We also work with some clients and provide them with out-of-hours customer support when their main offices are closed and when a customer wants immediate support in the evenings or on weekends. This is a simple service to set up as our clients just need to forward their customer support numbers to us when they close for the evening and they turn this off in the morning when they open up again. By providing the highest quality customer care, you make it very hard for a customer to leave you. And CNG Business Service’s customer support solutions will likely cost a lot less than the low quality care that your competitors provide, so both your customers and your bottom line benefit.